Two Hour Wargames has their Muskets and Shakos Napoleonic game on sale on their website. 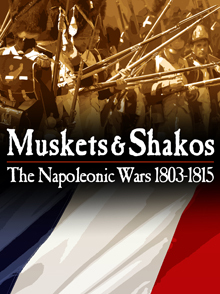 Muskets and Shakos, the Napoleonic big battle game from Two Hour Wargames, is now on sale. M&S is a Division scale, mass battle, set of rules, complete with army lists and a low book keeping campaign system. M&S can be played with any miniatures you may already have. M&S is playable solo and same side, as well as head to head.